Jewelry Making Class – Leather Cuff Bracelet & Earrings for beginners. Instructor Cindi Pope of 6:21 Treasures will guide you through all the steps to create your own hand stamped copper and leather cuff bracelet along with a pair of leather earrings! These bracelets will be customized, and you’ll be able to use our stamping tools to make the bracelet say any word or phrase you’d like. She will share her years of jewelry crafting with you! She will show you how to preserve your message in metal forever! We’ll cover how to clean your metal, basic hand-stamping techniques, riveting metal on leather, and finishing your pieces. 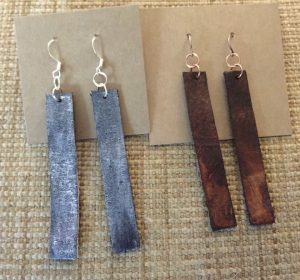 In this jewelry class, you, as the artist can learn to achieve deeper levels of design and artistry with leather and the careful art of metal stamping. The 2 hour class will show you how to create your own beautiful and detailed designs in copper and leather. At the end of class, you’ll have two unique, one of a kind jewelry pieces that you designed and crafted. This is a fun and informative hands on jewelry class. Tools will be provided for use in the classroom. All materials are included in the class fee. This class is scheduled for Friday, May 10th from 6 pm until 8 pm. Registration ends May 8th.